Remember Me! And this Pixar Coco Party Popcorn recipe for all you Pixar Coco fans out there! My family and I are in love with this movie, and I can’t wait to get this film on DVD on 2/27/18. Make some Churro Popcorn and have a Coco Party or Coco Movie Night to celebrate. The base starts with a Churro Popcorn, yum! Being a big Disney fan, this helps me get my churro fix. Then add in your favorite extras to make a Coco Party mix! The candy skulls are so cute, and they can be used for a Coco party, Halloween popcorn recipes, cupcakes, Día de Los Muertos recipes, or classroom parties. You can even serve this up for an Oscars Party, because Coco was nominated for Best Animated Feature! Fingers crossed they win. If you decide to throw a Coco Party or have a Coco movie night, then don’t forget to download these free printable Coco Coloring Pages and Activity Sheets (Páginas para colorear de Coco). My family loves to have Disney movie nights and a time to chill together. Check out the Coco Party Popcorn Recipe below! In a small bowl, mix together all the ingredients for the churro sugar coating and set aside. Next, pour popcorn in a large baking pan covered with parchment paper and set aside. Add granulated sugar, cinnamon, light corn syrup, and vanilla. Whisk the butter mix constantly, until mixture is smooth about 2 to 4 minutes. Begin to slowly drizzle cinnamon butter coating over popcorn. Use a spatula to toss the popcorn to evenly coat. Sprinkle the popcorn with the churro sugar coating, then toss to coat. Add all of the other ingredients to the popcorn and toss to mix. 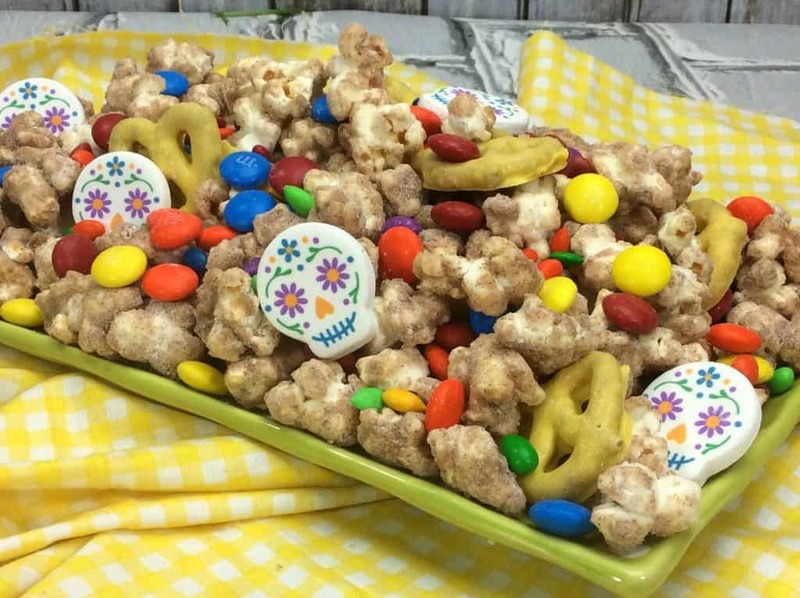 You and your guests will go Un Poco Loco for this Coco Party Popcorn! If you missed any of these Coco Easter Eggs, then take a look to see if you can spot any in the movie. Also check out the best Pixar Coco Gifts for all ages! This looks delicious! Quick question! When you say “a bag of Kettle popcorn” – do you mean similar to a bag of chips, already popped? Or, a microwave bag? Either way, about how many ounces should it be? Thanks! Can’t wait to have this at our Coco Movie Night tonight! Hi Julie! I’ve used bags like the size of chip bags such as the Boom Chicka Pop Kettle Corn. So approximately 7 oz. Have a great movie night! It looks like the cupcake candy skulls are no longer available. Any ideas for a backup? Oh no! That’s a bummer. There are different options. There are candy skulls from Amazon – https://amzn.to/2BMAo61. You can go for regular skulls – https://www.partycity.com/skull-icing-decorations-12ct-757805.html?extcmp=pla%7CGoogle&gclid=CjwKCAjw_IPcBRAjEiwAl44QkY0vFHL0DGVlfMHu1JsAFXqfO6SXMNgORPn-UiM5v0-OwRd5Tc6u5BoCZu4QAvD_BwE&gclsrc=aw.ds or colored ones – https://www.walmart.com/ip/Skull-Molded-Sugar-Cake-Cupcake-Decorations-12-ct/103041038?wmlspartner=wlpa&selectedSellerId=3529&adid=22222222227069113611&wmlspartner=wmtlabs&wl0=&wl1=g&wl2=c&wl3=176575322795&wl4=pla-281771626968&wl5=9007586&wl6=&wl7=&wl8=&wl9=pla&wl10=113500206&wl11=online&wl12=103041038&wl13=&veh=sem. Hopefully as the holiday gets closer, they’ll have more options, too!